I touched it and squealed! Never before had I ever seen anything like it....and I cannot even tell you what they are! Even my dear and unassuming husband as clever as he is, couldn’t put a name to them. We discovered these amazing creatures this morning, after deciding to go for a walk on the beach. It’s always fascinating to see what the stormy weather has taken...and left behind. Well it had dragged plenty of sand back into the sea, leaving remains of shipwrecks exposed on this large stretch of sandy beach, known as Rhossili Bay on the Gower Coast. I took lots of photo’s which I will put on my ‘Explore Gower’ page but this one, I just had to write about. It’s the oddest thing! You can see for yourself, these tiny shell creatures are attached to a tree, washed up on the beach. I touched one (the worm part) and indeed it felt just like a worm....ugh! I’m sure our dear hens, back at our home for waifs and strays, as much as they love worms, would not be tempted by these strange but wonderful creatures. So if anyone reading this can put a name to them, then please free to leave a message. As for the shipwrecks, they were equally amazing, and left me thinking about how they came to be there. How strange, I thought, that almost 200 years later, they still cling to the ground where they fell ...almost as if they are determined never to leave without the men who sailed upon them....tis very sad! 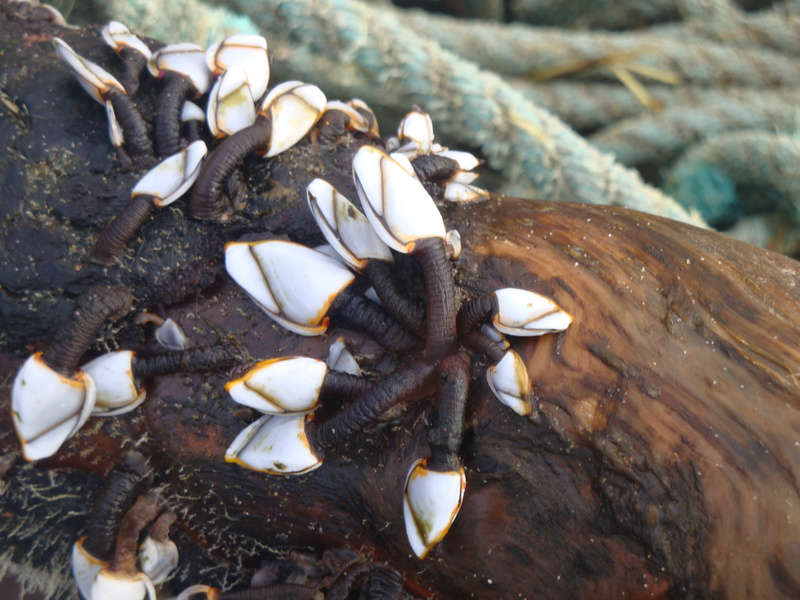 Ah I can smell the salt of the sea air whilst reading your tale of the strange creatures of the sea - they are Goose Barnacles, an expensive delicacy in Spain and are harvested on the north coast of Galicia.